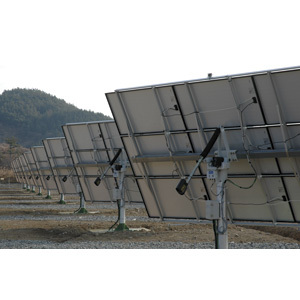 Azimuth trackers automatically track the sun’s path by rotating the PV array around the pipe, providing greater stability for larger arrays. The corners do not protrude down towards the ground or stick up in the air to catch the wind. The bottom edge of the array always remains parallel to the ground and requires less ground clearance than tilt and roll trackers. Wattsun’s azimuth trackers provide nearly 270 degrees of rotational movement and can adjust from 5 to 75 degrees of elevation tilt. The AZ-225 gear-drive, azimuth tracker is for very large arrays. 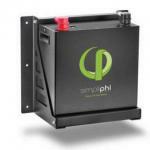 It can hold over 2 kW of solar modules. It is powered by a 24VDC motor running a heavy-duty ball bearing/ worm gear drive. It comes standard with the dual-axis option, enabling it to capture the maximum amount of solar energy. Mounts on a 8" or 10" schedule-40 steel pole. 10" poles will require an 8" section welded to top. 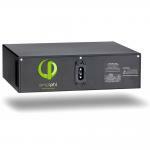 If your system voltage is not 24 VDC, you will need a Wattsun voltage converter. See option table below. Call us for pricing on other Wattsun trackers for different modules and module quantities. THIS ITEM SHIPS BY TRUCK FREIGHT WE WILL CONTACT YOU TO CONFIRM PRICE BEFORE PROCESSING ORDER.